There was a lot of potential in this one, potential that was unfortunately wasted. 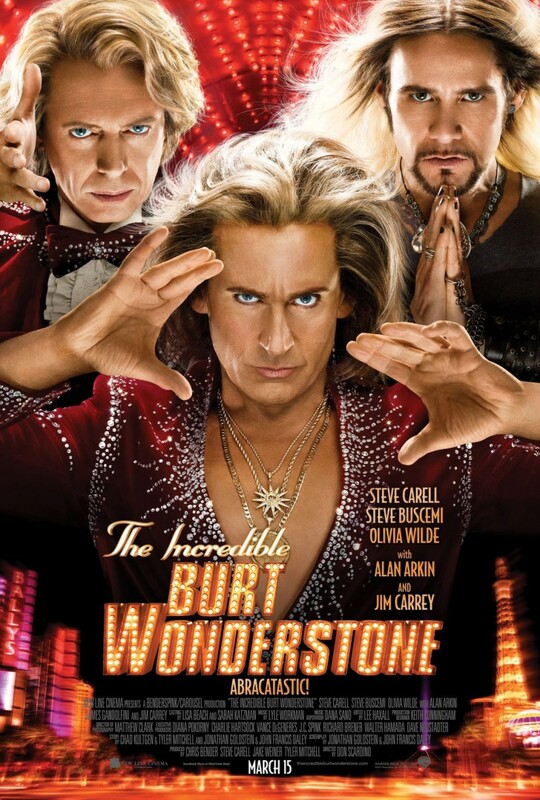 The Incredible Burt Wonderstone tells the story of the eponymous Burt (played by Steve Carrell) and Anton Marvelton (Steve Buscemi) who formed a friendship based on a mutual love of magic and a shared experience of being social outcasts. Thirty years later, the two of them are headlining a magic show in Vegas, but their friendship has suffered due to their success. Burt has become a self aggrandizing, womanizing, man-child who cares more about expensive frivolities and bedding women than he does about his performance or his best friend. As the two muddle through their show a new street “magician” begins to rise in popularity. Steve Grey’s (Jim Carrey riffing on David Blaine and Criss Angel) televised stunts, which often feature various instances of self-harm, start to draw crowds away from Burt and Anton, and when they attempt to take on Grey at his own game the results end up ruining their careers and their friendship. This feels like the first or second draft of what might have been a really good movie. The premise is good, the character concepts are strong, and the casting is great, but nothing ever quite clicks the way that you feel it should. Steve Carrell does a good job playing against type as an egotistical jerk, but his character never gets to feel rounded and we never really get to see anything beyond the type of character he’s playing at that moment. He is whatever the story requires him to be at the time when it’s needed, but these end up feeling disjointed and disparate rather than a cohesive part of a whole performance. Steve Buscemi is good, but is unfortunately not given enough to do and Olivia Wilde does what she can with a role that is essentially the reward for Burt Wonderstone’s arc. Of the cast I would say Alan Arkin and Jim Carrey are the most fun. Alan Arkin is more or less doing his standard Alan Arkin routine, but he brings a lot of heart to the role, and is one of the few who portrays a tangible love for magic through their performance. As for Jim Carrey, he has a great riff on the newer wave of “magicians” who aim more to shock and appall rather than fill an audience with delight and wonder. There’s a lot that works well enough in the film, and it does come with a few laughs and has a good deal of heart, but on a basic story level everything feels half-baked. There are so many moments in this film where they hit a story beat that settles for “good enough” when there’s an opportunity for “great” waiting in plain sight just a little bit further. There’s nothing that’s particularly worth complaining about, and the film does what it needs to do to earn a few laughs and keep you reasonably diverted, but it’s disappointing, because there’s untapped potential just under the surface of almost every moment in the film. There’s not really a whole lot more to say other than that. I wouldn’t make a point of seeing this one, but if you do end up watching it it will likely keep you amused for its duration, after which you’ll go on to forget that the film ever existed. It’s too bad it couldn’t have been better.